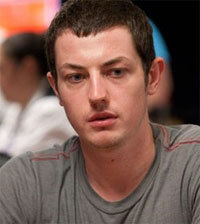 Thomas Dwan Jr., better known as Tom Dwan a.k.a. “Durrrr”, was born in Edison, New Jersey on July 30, 1986. During his time studying at Boston University he started playing at various Sit and Go poker games. He realized he had a real talent for winning at these games. He started to expand his repertoire and played in ring poker games. Although he was not yet used to ring games, he still managed to make money while playing them. This is when Dwan decided to drop out of college and pursue a career as a professional poker player. Tom Dwan got the nickname Durrrr, since that was his handle when he played in online poker games. He is best known for the amount of time he has spent playing in all kinds of online poker cash games and poker tournaments. In 2007 he managed to earn a total of $312,800 while playing poker online; afterwards he won $5.41 million in 2008. He has hit a few bumps along his career, losing big chunks of his bankroll at a time. This has not slowed him down at all though, since he has managed to win back every penny he has lost. During an online challenge from a person using the handle “Isildur1” during what is said to be the longest run in history in online poker by a player; Dwan lost roughly $5 million during that time. This is when Dwan decided to challenge Isildur1 to play in the Full Tilt Poker Durrrr Million Dollar Challenge. After a few other losses and wins, he ended up having a total of $3.3 million in 2010. Tom Dwan is not just known for his online playing, he has also participated in the World Series of Poker and other tournaments as well. He has been unable to win any bracelets at the WSOP; however he has made it very close. He has come in 8th place, 9th place, and has come in 2nd place as well. During all of these times he has been able to cash-out regardless, although he would have preferred the win than the cash. He has also participated in the World Poker Tour, where has yet to win a title. He has made quite an impact in the poker world due to his young age and the success he has managed to gain. Because of his young age, he does not need to worry about winning or losing, he has gained a lot of experience while playing and that will get him the win further down the road. Tom Dwan started his poker career later on in his life, while at college, and has since then exploded in fame, as well as in fortune. By playing mostly in online poker tournaments and cash games, he has managed to amass a small fortune that most people his age only dream of. Just from playing online, he has been able to become a millionaire, as of 2010 he has $3.3 million in the bank. This is why a popular online poker site, Full Tilt Poker, took the opportunity in early 2009 to add him as a team member (before Full Tilt went down at least). He regularly plays on the poker site, and also organizes events such as his million dollar challenge. With live tournament play he managed to make, as of 2011, over $2.1 million. He has participated in big name tournaments such as the World Series of Poker and the World Poker Tour. During his time in the WSOP, he has been able to play at 4 final tables, with 10 money finishes. While playing in the WPT he has been to 1 final table and had 2 cash finishes. He has also made an appearance at the European Poker Tour where has had 1 cash finish. This may not seem like good stats, but taking into account his young age and how much more experienced he is getting, we can expect great things from Tom Dwan in the near future.